August Burns Red vocalist Jake Luhrs is living the dream. “I joined (ABR) a little later than the other guys, but it was a serendipitous chain of events,” he said. “It was 2006, I lived in Columbia South Carolina. I was in a band, and we’d broken up five months earlier. “August Burns Red had just released Thrill Seeker, I was really into it and like a week later a buddy of mine said they were looking for a new singer, so I emailed back and forth with the guys for a bit and they said they wanted me to come sing for them. “I quit my job that that, packed up my car, went to Pennsylvania and started practicing. Luhrs said he had the full support of everyone back home. “My whole family is really supportive, even my boss was really good about it,” he said. The band is oft-described as “Christian metalcore,” a term Luhrs laughs at. “There are so many different ways to describe music these days,” he said. “It’s like, this is emo core, that’s punk core, that over there is just emo… it’s ridiculous, really. Luhrs’ gamble certainly paid off. The band’s latest release, Rescue & Restore, debuted at number nine on the US Billboard charts – a feat virtually unheard of for a band in this genre – they just wrapped up a Vans Warped tour and some European headliners, and Luhrs recorded guest vocals on Blessthefall’s track, Carry On. “It has been a crazy, wild and very fun ride,” Luhrs said. “Personally, I think the new record is the best representation of ABR musically and lyrically thus far. “We spent over 100-plus hours in the studio on vocals alone, whereas previously we’d be lucky to spent seven days in the studio. “A lot of bands these days seem to replicate each other, and somehow lack the ability as artists to express themselves, which is kind of sad when you think about it. Metal is not necessarily the obvious genre of choice for this former handyman. “As a kid I grew up on rap,” Luhrs said. “I listened to Tupac, Biggie Smalls, Beastie Boys… that’s what all of my friends were listening to, and that’s what I associated with growing up. “I got into a bit of punk rock like Rancid, Operation Ivy and Dead Kennedys, then started getting into Norma Jean, and a band called Hopesfall, who were based where I was living at the time. “Those guys really caught my ear because they were screaming, but it doesn’t sound nasty at all, if anything the screaming just brings more emotion to the music. 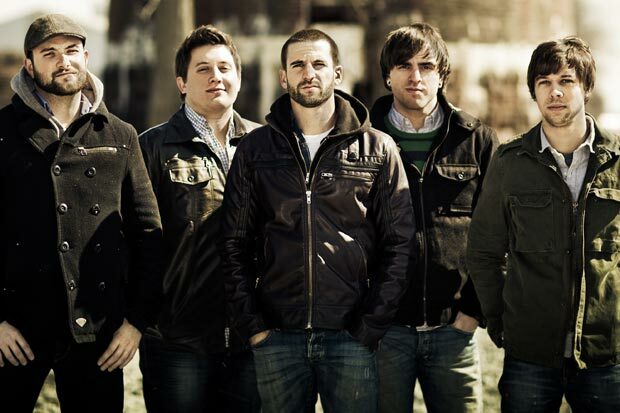 August Burns Red’s previous release was just as unusual, for a metalcore band. “Every two years ABR has covered a Christmas carol,” Luhrs said. “Every year we hold a Christmas show in Lancaster, where we’re from, and we play Christmas songs and it’s just something the kids have come to know and expect, I guess. The result, August Burns Red Presents: Sleddin’ Hill, included such covers as Jingle Bells, God Rest Ye Merry Gentlemen and Frosty The Snowman. “That record has actually been really well received,” Luhrs laughed. ABR will be heading to Australia in February for the Soundwave tour, but they have toured here before – with Aussie natives and Vans Warped darlings Parkway Drive. “When we first came to Australia we knew it would be special and exciting,” Luhrs said. “I think our first show out there we played to 5,000 kids, it blew us all away. August Burns Red will be performing at Soundwave 2014. For more information visit the web site. Rescue & Restore is available in stores now.